Urban Meyer is so competitive that he once put together an epic 25-1 run at Florida, which included capturing his second national title in three seasons. Yet when he finally lost the 2009 SEC title game, the distress from the meat grinder was so intense he wound up in the hospital with heart problems. Meyer then quit, for a day, only to return for another season. He quit again, took a year off, accepted the Ohio State job, went 12-0 and signed a consensus top-three recruiting class in his first full-year effort. The man knows only one way to go, full-throttle and with fists closed. He'll apologize for none of it. He'll expect the same from everyone else, including, apparently, his peers in the Big Ten, who he doesn't think are pulling their weight. Forget just coaching his team, he's concerned about the other 11 programs, too. Speaking on the Bishop and Rothman Show on 97.1 FM in Columbus on Thursday, Meyer called out most of the Big Ten after many conference schools fared poorly in recruiting this year. The Big Ten, Meyer said, has to step it up. "It's not only important, it's essential," Meyer said. "It has to happen." And that is about the most Urban Meyer thing Urban Meyer could say, even if it will likely go over like a SEC banner flapping on a Midwest campus. While Michigan also signed a highly regarded class (ranked fifth nationally by Rivals.com), Nebraska (17th) was the only other Big Ten school to rank in the top-35 classes nationally according to Rivals.com. Other than the Wolverines and Buckeyes, only Penn State landed a coveted five-star recruit. Compare that to the SEC, which saw 13 of its 14 schools rank in the top 31, according to Rivals.com. As a group, the SEC signed 14 of 33 recruits ranked as five stars by the website. While recruiting rankings don't guarantee future results – predictably, every Big Ten coach claimed he was pleased with the players he brought in on Wednesday's National Signing Day, no matter what Rivals.com had to say – Meyer himself is concerned the conference isn't as competitive as it should be. And he isn't afraid to address it, both publicly on the radio and privately in an upcoming coaches meeting. "I don't know enough about what goes on in the other programs. 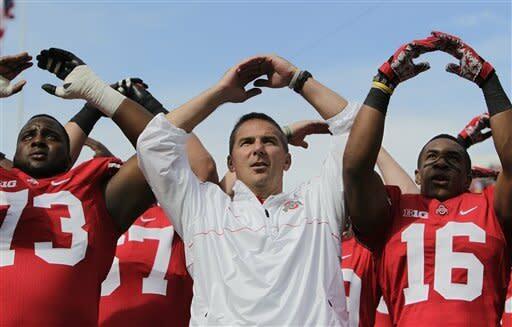 I know I have a lot of respect for the tradition and their historical success they've had," Meyer said. "But we do need, as a conference, to keep pushing that envelope to be better. "And I think all our conversations, we're going to have a Big Ten meeting here in a week … and our whole conversation needs to be, 'how do we recruit?' When you see 11 of the SEC teams in the top 25 in recruiting, that is something we need to continue to work on and improve." Meyer is absolutely correct, of course. How this goes over with Meyer's peers, though, is anyone's guess. He ruffled feathers immediately a year ago by directly recruiting players that were already verbally committed to other league schools, perhaps violating an unwritten rule. Meyer scoffed at the concept. Just as he doesn't think he's stepping over the line by calling out other programs for their lack of success, or declaring that the push for everyone to improve be the sole topic at a league coaches' meeting next week. That's Meyer, bringing a big dose of SEC intensity to the snow-covered Big Ten, which has been on a downward trajectory – be it on the recruiting trail, bowl results or non-conference games. The current way of doing things, Meyer figures, isn't working. So something, and someone, better figure out a new plan to challenge him. The Big Ten was built on Ohio State and Michigan dominance, but for many years Bo Schembechler and Woody Hayes, respectively, could offer unlimited scholarships and stockpile talent away from other schools. These days, no one can offer more than 85 total scholarships and the Buckeyes are stuck on 82 because of NCAA sanctions. Presumably, the Midwest talent should be spread around, even before teams venture into other regions. Unfortunately for the Big Ten, non-league programs are raiding what's left in the Midwest. The eight states in the league's current footprint produced three players this year rated as five-star recruits by Rivals.com. The Big Ten signed none of them. The highest-rated recruit in six of eight states chose to go outside the league. Moreover, 19 of the 51 players in the region ranked as four-star recruits went elsewhere, with the SEC (eight recruits) and Notre Dame (six) benefiting the most. Ohio State, for one, is concentrating on recruiting nationally, particularly in Meyer's old Southern stomping ground. Michigan and Nebraska are also branching out. Everyone else has room for improvement, to say the least. 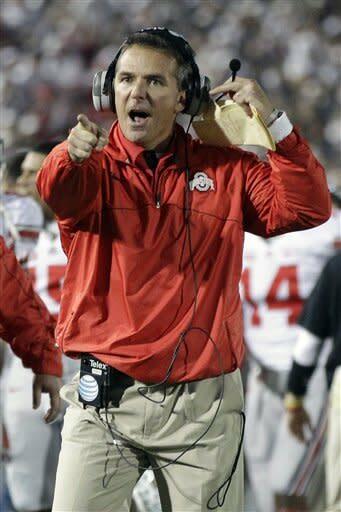 While trying to help your opponents improve sounds strange, Meyer's concern is real. He could have a team capable of another undefeated record this coming season, but a weak non-conference schedule and the possibility of another down year in the league could hurt the Buckeyes' strength of schedule and thus a chance for a BCS title game bid. What exactly Meyer plans to discuss with his fellow coaches isn't known. He has, in recent days, suggested little things like moving game times away from the traditional noon Saturday kickoff to help get high school stars on campus for visits. "If you want to get players to your game, it's hard to get them there at noon," he said. So more night games is a start. Of course, he might just demand everyone be more aggressive, more SEC-like, where this stuff is painfully serious. It's quite possible his conversation will go nowhere, with no coach in the league interested in hearing suggestions on how to recruit better, let alone from Urban Meyer. About the only certainty is this: Meyer is going to say his peace. Publicly. Privately. No hard feelings, guys, but he needs someone to keep up with his Buckeyes. He isn't doing this just for fun.